SANTA CLARA, California — Scroll down a list released Thursday of people who are publicly supporting Seattle Seahawks defensive end Michael Bennett after his harrowing encounter with police, and you’ll spot many familiar names. San Francisco 49ers safety Eric Reid made sure his would be among them. The first player to join then-teammate Colin Kaepernick last season in kneeling during the national anthem in order to draw attention to the oppression of black people and people of color in the United States, Reid is a leader in the NFL players’ push for racial equality. Bennett, an outspoken proponent of players using their platforms to effect social change, has been in step with Reid at the forefront of the movement. Along with a still-growing list of other like-minded players who are willing to risk their careers to continue what Kaepernick started, Reid and Bennett say they won’t stop fighting for what’s right. And by adding his name to the list of those who stand with Bennett, Reid believes he’s doing much more than simply supporting his brother in the struggle. “What happens in a lot of these situations, a lot of times, is that they [the people in power] try to make you feel isolated. They want you to feel like you’re alone, trying to fight against it [the system] so you’ll give ground,” Reid said after practice Wednesday at the 49ers’ facility. “They want you to give in and not fight back for what’s right, fight for the truth to be put out there, and what happened to Michael is exactly what we’ve been talking about for a year now. Increasingly, NFL players have come together to make their voices heard during a time of heightened racial discord nationally. Bennett’s encounter with police, Reid and other activist-players say, is a textbook example of the disproportionately negative experiences that many people of color have with law enforcement, but “what we’re talking about really includes everyone. This is about all races,” Reid said. “Yes, we highlight the fact that officers mistreat black and brown people, and the system does in America in general, but these situations happen with all races. Eli Harold #58, former 49er Colin Kaepernick #7, and Eric Reid #35 of the San Francisco 49ers kneel on the sideline, during the anthem, prior to the game against the Los Angeles Rams at the Los Angeles Coliseum on December 24, 2016 in Los Angeles, California. Since last season, Reid has spread the word. 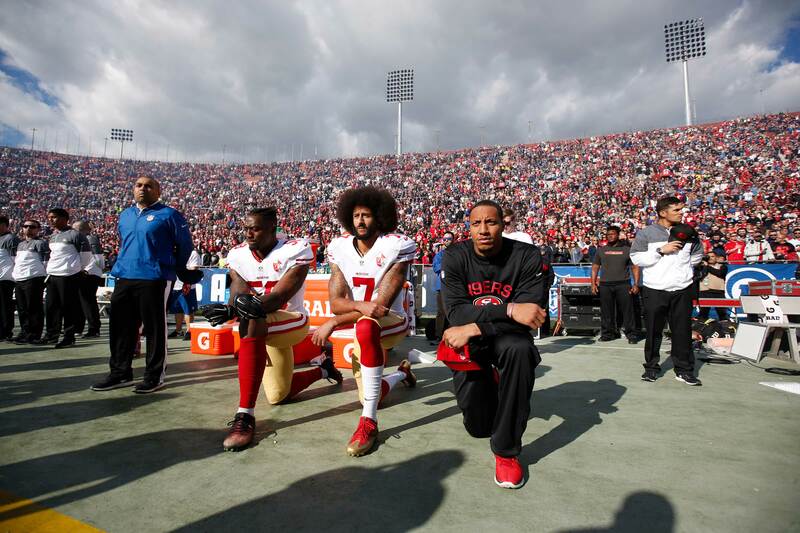 He worked closely with Kaepernick, with whom he’s still close although they’re no longer teammates, in an effort to bring maximum attention to their message. Reid has participated in Kaepernick’s Know Your Rights Camp events. He also continues to consult with the accomplished free-agent quarterback — who remains unemployed, many NFL players and civil rights activists believe, because his peaceful and impactful political protest was unpopular with NFL owners. Reid, frustrated about “the false narrative being told about us, that we’re totally against police and the military,” had planned to end his anthem protests before the 2017 season and focus on making a difference in other ways. However, then came the violence in Charlottesville, Virginia. After discussing the situation with Kaepernick, Reid reconsidered, deciding that, at least for him, it was still time to take a knee. “The only way that change is going to happen is if it starts with conversation first. To get the conversation started, sometimes you have to do something that’s going to shake things up,” Reid said. “We understand that it makes some people upset. We’d just like you to open your mind, hear what we’re talking about and really hear why we’re doing it. By following Kaepernick, Reid risked a lot. An All-American at LSU and the 18th overall pick in the 2013 draft, Reid has been a steady player for San Francisco (as a rookie, he was a Pro Bowler). Like many other players, Reid could have just stuck to football and avoided being caught up in the widespread fan backlash to anthem protests. For Reid, though, remaining on the sidelines simply wasn’t an option. “There’s a risk there for everyone involved in this,” Reid said. “But this is fueled by my faith. I started doing this because I believe I need to use my platform to be a voice for the voiceless and speak up for people who are being oppressed. Sociologist Harry Edwards is with them in the fight. Since the 1960s, no one has been more active at the intersection of race, sports and politics than Edwards, professor emeritus at the University of California-Berkeley and a longtime 49ers consultant. It was Edwards, through his creation of the Olympic Project for Human Rights, who inspired the iconic Black Power salute displayed by Tommie Smith and John Carlos at the 1968 Summer Olympics in Mexico City. Not only is Edwards, whose name also appears on the list of those who stand with Bennett, proud of Reid, Kaepernick, Bennett and all the players who have taken a stand, he’s “in awe of these young men, who put everything on the line in order to make a statement about broader concerns and issues. This goes back to the spirit of Muhammad Ali. This goes back to the spirit of Jim Brown and Bill Russell, both of whom were in their 20s and active athletes when they supported and expressed sentiments of support for broadening the base of the democratic participation in American society. Although Kaepernick is out of the league, he’s still very much in the game. He continues to commit his time and financial resources in an effort to uplift the less fortunate, and he has become the face of the new civil rights movement. If Kaepernick is being blackballed, as even superstar quarterback Aaron Rodgers believes, his NFL playing days could be over. But Kaepernick’s impact on the movement is as strong as ever, Reid said.